Shackleton originally wanted to purchase a Norwegian sealer called the Bjorn for his Antarctic expedition, but that ship cost £11,000 and he could only be sure of £8,000 for the whole expedition, maybe only £7,000 at the time he bought the ship. The Nimrod at £5,000 was very much a second choice. Built in Dundee as a sealer and working with the Newfoundland fleet until purchased for the Antarctic expedition. 41 years old at the start of the expedition. Barquentine / 1 funnel, 3 masts / L,B,D 136' x 26.9' x 16' - 41.5m x 8.2m x 4.9m / 334 tons / Hull: wooden / compliment - 14 / Engine compound steam 60nhp / 1 screw / 6 knots top speed / Built: Alexander Stephens and Sons Ltd, Dundee, Scotland 1865. 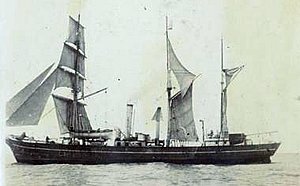 On return to Britain in 1909, the Nimrod was initially used as a floating museum of the voyage before being sold by Shackleton in 1910. 10 years later after on the 31st of January 1919 the Nimrod was wrecked and smashed to pieces in the North Sea, after running aground on the Barber Sands off the coast of Norfolk coast . Only two of her crew of 12 survived. Shackleton wanted to rename the ship Endurance from his family motto "Fortitudine Vincimus" - By Endurance we conquer. But in the event, this title was to be bestowed on the ship he would use on his next Antarctic voyage. The Nimrod was already forty one years old and only just over 300 tons with a maximum speed of a mere 6 knots. She was sailed to England and arrived in the Thames in mid summer appearing even worse than her statistics would imply. She was battered, grim, soiled from her sealing voyages and had weak and decrepit engines. The name Nimrod was allowed to remain. After a refit which amongst other things involved changing the sailing rig from schooner to barquentine, the Nimrod was ready to sail. 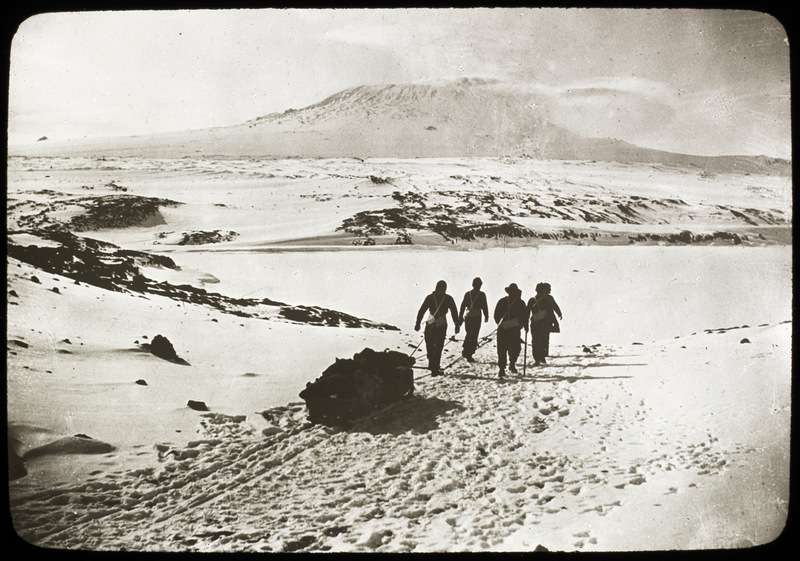 Money pressures continued to dog Shackleton with the added complication that his brother Frank was in severe financial difficulties and could become bankrupt - the last thing that Ernest needed as he was trying to remain respectable and should he himself not remain creditworthy, the whole expedition might fail. To make matters worse Frank was implicated in the theft of the insignia of the Order of St. Patrick from Dublin Castle - an event known as "The theft of the Irish Crown Jewels". Shackleton was hoping for the patronage of King Edward, if assured this might give him a respectability that would assure the expedition. Such patronage was not forthcoming. 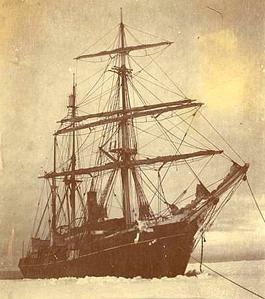 On the 30th of July 1907, the Nimrod left her berth at the East India Docks to begin her voyage to Antarctica. In the Thames estuary she was overtaken by a Royal Navy torpedo boat with a message commanding her to attend the annual sailing regatta at Royal Cowes on the Isle of Wight to be inspected by the King. This was a shrewd political move by the king to ultimately prevent any embarrassing disclosures coming out from the Irish Crown Jewels affair and also as he saw that his reign might benefit from Shackleton's success if he could pull it off. It came about therefore, that the Nimrod, a grubby little old sealer was boarded by the king and his entourage in full Edwardian finery and was given the berth of honour at Royal Cowes next to HMS Dreadnought the most powerful ship (and the first modern battleship) in the most powerful navy in the world. Shackleton was also honoured by being given a flag by the queen to take with him. The Nimrod then left for Torquay from where she finally sailed south on the 7th of August. She called in at Lyttleton New Zealand en route for final stores from where she left considerably laden down with her plimsoll line almost two feet under water and with only 3 feet 6 inches of freeboard (height above the waterline). She was weighed down with amongst other stores and requirements, a motor car in a crate, twenty live sheep and ten ponies. Such was the cargo on Nimrod that she couldn't carry enough coal to take her to Antarctica and back. Although she was a sail and steam ship she needed to use her engines. 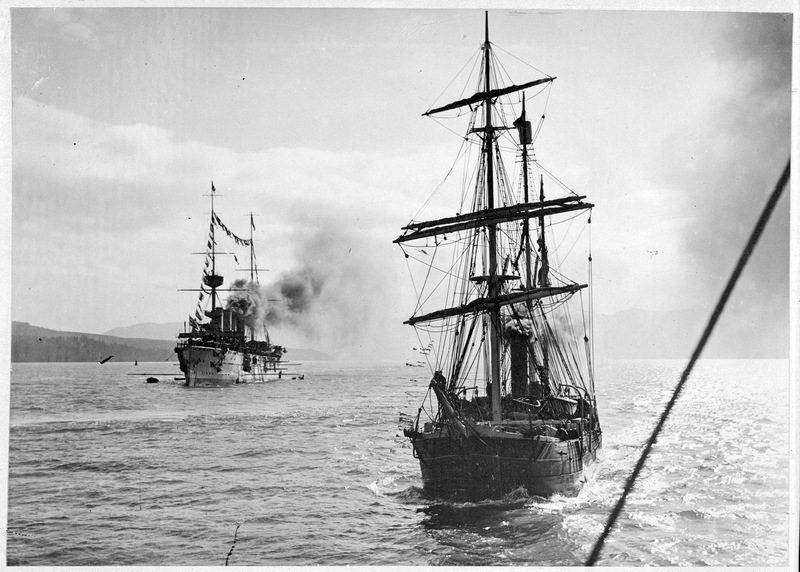 Shackleton had realised that he would need a tow, so after an appeal to the New Zealand Government, a tramp steamer of about 1,200 tons, the Koonya was supplied with the government meeting half the cost. 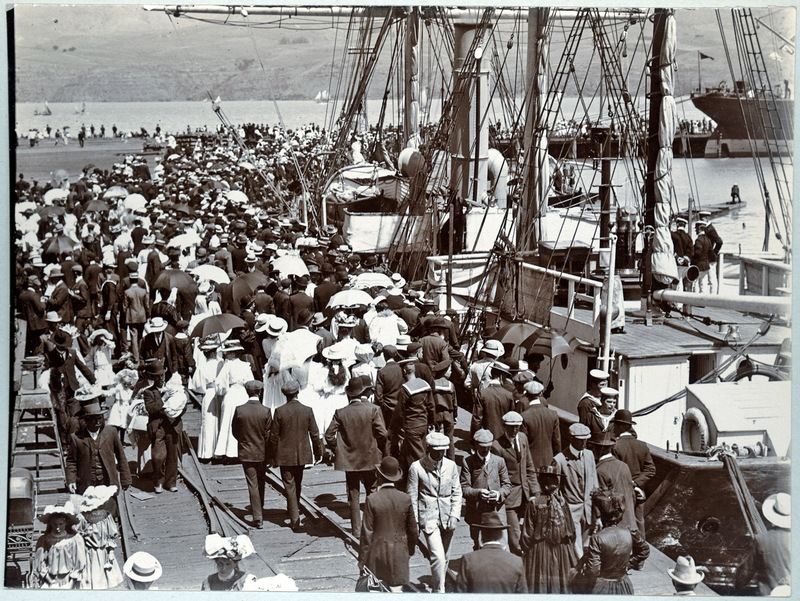 The ship's owners, the Union Steamship Company of New Zealand waived the remainder of the fee. The Nimrod was one of the smallest ships to go to Antarctica for over sixty years. The journey south was stormy and miserable. Water flooded on board and dripped and permeated throughout the ship. The ship regularly rolled up to 50° each way. Although all on board were well used to the sea and storms, to be in such a small ship in such high latitudes was a new and novel experience. On the 15th of January, pack was sighted and the Koonya had to return home. By the time the Nimrod reached the "pack" it turned out to be a labyrinth of icebergs in two belts a hundred miles across. There was plenty of open water, but the passage through had to be picked out carefully. Shackleton intended to land at a place known as Barrier Inlet as mapped on Scott's Discovery expedition some six years before. After days of searching, sailing up and down the ice barrier it became apparent that a large part of the ice shelf had broken out to sea so changing the topography of previous geographical features. (The coast of Antarctica is a map-makers nightmare, by the time any map has been published, the coast will no longer be as it was due to ice breaking out and changing the shape. Shackleton considered landing the Nimrod at a place that was spontaneously called the Bay of Whales for the numerous spouting whales in the area. He and the captain of the ship agonized as to whether they should land there or not. In the event, worries over impending pack ice meant that the ship was turned around and headed for McMurdo Sound where she eventually berthed. 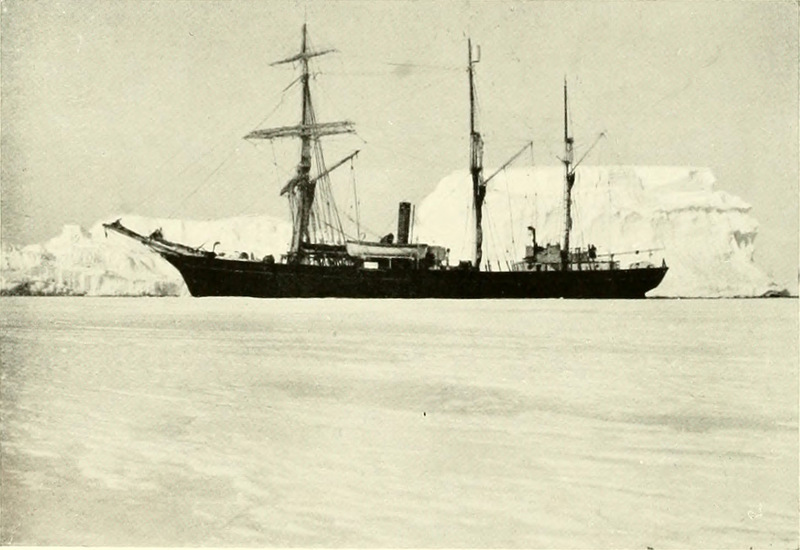 She anchored to the sea ice edge some 16 miles from land at Hut Point where there was a hut remaining from Scott's Discovery expedition in 1902. Preparations were made for unloading, but this was delayed to allow the ice to break up further back to Hut Point. By February 3rd the ice had indeed broken back to Hut Point and so the Nimrod was fastened alongside the ice foot and unloading began. 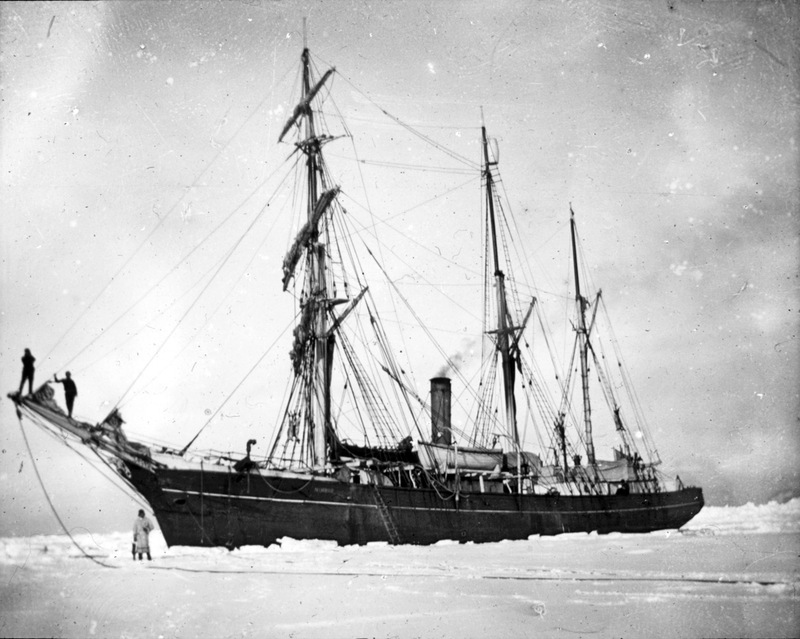 Ice and wind conditions hampered the unloading and the Nimrod periodically put back out into the bay in bad conditions to prevent the danger of being iced in or damaged by pack, and as often as not due to the nervousness of Rupert England the ship's captain. The shore party and crew of the ship came at odds over their views of England. The crew were generally in his favour for not risking the ship, while the shore party disliked him for what they saw as his exaggerated and excessive caution had jeopardized their safety. At one point Shackleton tried to take over the command of the ship from England (they were both equally inexperienced in these circumstances), but England refused to relinquish and nothing could be done until the ship put into port again, so England continued as captain. The Nimrod eventually left McMurdo sound for New Zealand on February the 22nd.